If you do go with a screw you can just design a hole slightly smaller than the threads. This way there's no drilling or tapping. The threads will bite into the plastic. I did it this way for a recharge port and rice port. Again, mind your thickness. and i never considered epoxy..then again not my favorite thing to use, but good to know about. and i understand what you're saying about the hole, and makes perfect sense cant believe i didnt think of that before..
Ok so now that spring semester is over for me I had more time to keep working on the design and inner workings. Heres the wiring diagram using the knowledge that I think i know about this stuff lol. Hoping to just see if its right using the Prizm V4, and a RGrB tri cree. only thing I forgot to put on the diagram was the RICE port on the back. Little bit thrown off with wiring cause of the sound board so just curious if I did this correct in regards to resistors and recharge port. Also, Im also wondering: Do I need anything else to allow for the changing of color on the fly that the Prizm can do? Im not clear on whether or not its a board feature only or if you have to have other hardware to get that working? Last edited by Hermitjensen; 05-09-2016 at 01:47 PM. The positive pads on the main LED are supposed to be connected to the main positive pad on the board. The negative pads on the main LED should be connected to the three color channels (the wires with the resistors in your diagram). Thanks for pointing that out! Will make a note to myself to remember that. 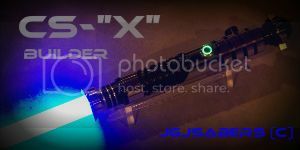 Color changing is as simple as pressing both pwr and aux simultaneously while the saber is on. The board handles it all with nothing extra needed. Ok thats what I thought, thanks for confirming that. If you want to try and make your own bunny ears, I've seen people use aluminum u-channel for that. ok so over a year later. 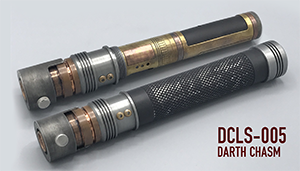 I now have all the parts for this saber (well 99.5%..forgot a kill key, the blade, and usb-RICE cable lol) and wanted to start work on the outside of the hilt and the shroud pattern. which I figured awhile back would most likely require a drill press to make it even on both sides of the shroud work. So this whole summer my project has been to get my late-grandfathers old Shopsmith up and running again (was in our garage for 15yrs..) and finally got that working and tested out drilling a few holes in random bits of aluminum and that works. but now i'm alittle stuck on how to do my planned shroud pattern..
My plan was to just drill a bunch of holes going down where the channels will be and then sanding/filing away the 'teeth' that is left behind. I'm just wondering if you experts out there were tasked with doing a shroud like this how would you go about it? Print the design on paper and wrap it around the shroud material using spray adhesive. If you can, get yourself a cross slide that will fit the drill press and has enough travel to cover the length of the holes you need to drill. It will make life so much easier. If that's not an option just go slow. Drill the holes smaller than the final size. Then file to the printed line on the template.